The stem forms almost a prow. Builder went for a boxy look. Here’s a boat of a kind you don’t see every day. I spotted it Thursday afternoon in the parking lot at Albany’s Takena Landing Park. 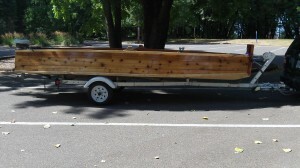 I loitered for a while hoping to learn more about this apparently home-built craft, but the owner didn’t show. What struck me was the unusual shape: Completely flat on the bottom — no fore and aft rocker at all, and not even a shallow V across. Sitting on its trailer, it even looked as though the bow and stern were a little lower than the mid-section, but I think that was an optical illusion. 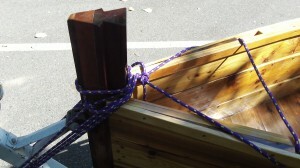 The trapezoidal shape of the transom required the sides to have a pronounced tumblehome. Put another way, the aft section was wider at the bottom than the top. 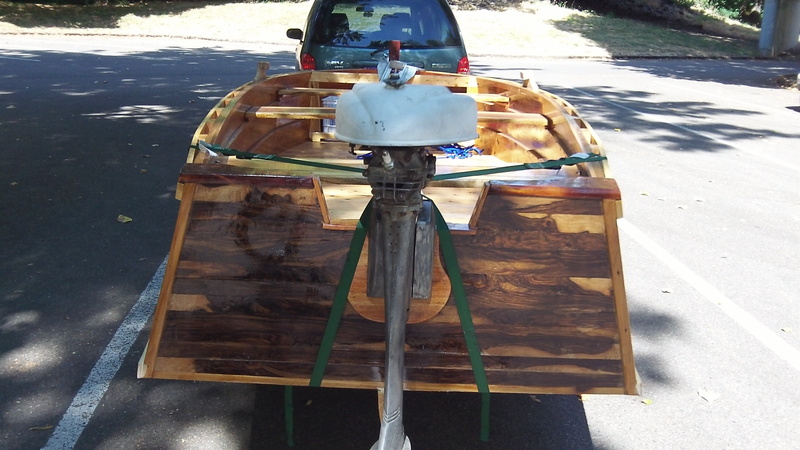 The craft was equipped with a small outboard, and in case that failed it also had oarlocks. From the aroma of varnish in the summer sun, it smelled and looked like a project only recently completed in somebody’s garage. 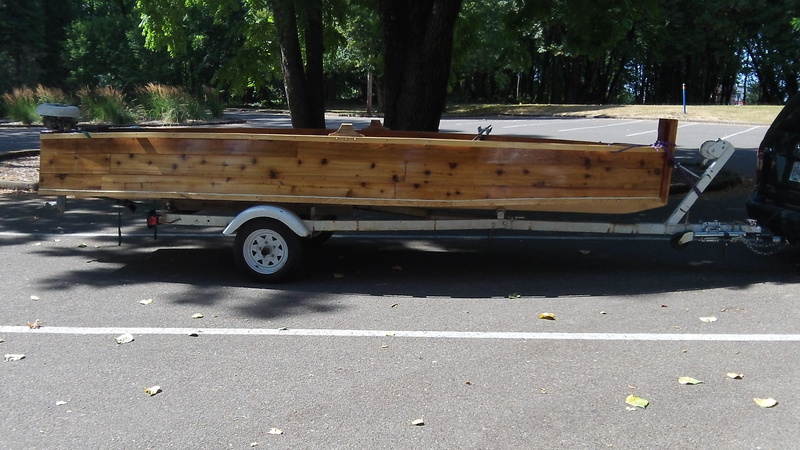 With its boxy shape, this vessel would have a hard time in any kind of a seaway with the wind blowing, but it might just be the perfect shape for a flat river like the Willamette.